The NSCF Annual Conference is, without a doubt, a great opportunity to get to know our Nordic colleagues and network. The promise of focusing on cooperation between science centres at the 2018 conference in Tallinn, Estonia, however, brought together a record number of delegates – a total of 51. Looks like we’re quite keen to work together! At the conference, hosted by Energy Discovery Centre in Tallinn from 9–11 October, both the NSCF Board and the Centre’s team were hoping to create an inspiring atmosphere where member would have the chance to generate new ideas and explore the possibilities of cooperation. The programme consisted of sessions and workshops, mainly presented by NSCF members themselves. How better to know more about the experiences and competencies of our colleagues? Hopefully there were many opportunities to network with colleagues. At the welcome dinner in the Centre’s Lightning Hall, the Centre’s team demonstrated our hair-raising Van de Graaff generator demo, and later on the Centre’s inventor Aare Baumer entered the giant Faraday cage in a metal suit weighing about 30 kilos to face Tesla coils generating an electrical current up to 500,000 volts with bravado. Tense for some, electrifying for others – and hopefully a decent kick-start for the conference. The sessions and workshops covered topics from integrating the UN’s 17 Sustainable Development Goals to the programme and operational side of Nordic science centres, to exhibition trends for the next five years. The second conference dinner was served at Tallinn TV Tower – hopefully an elevated experience, or at least worthy of some nice photos as the tower is light as if a UFO descending, with a clear starry sky as a backdrop. And it’s great that there were the brave and tireless, who managed to experience Tallinn night life as well. 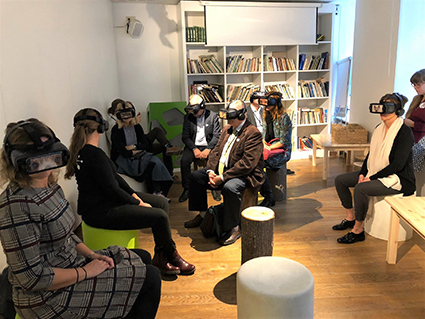 The delegates were also invited to the Estonian Museum of Natural History to witness the ins and outs of creating an exhibition, and to watch a 360-degree VR film, and to the Estonian Healthcare Museum, where antics ensued in a dentist’s chair. As always, the best things are saved for last. News from members is a treat, and this time around made me wish we could start the conference all over again. The farewell lunch and visit of the Seaplane Harbour hopefully were an appropriate finale. The team at Energy Discovery Centre would like to thank each and every one of our lovely delegates and wish Lars and his team at VilVite good luck with organising the next conference. Hope to see you all in Bergen next year! Oh – and hopefully even sooner in Copenhagen for the Ecsite 2019 conference hosted by Experimentarium!